If you have a rodent problem in your home, you might be tempted to take a do-it-yourself approach and set some mousetraps around the house to capture your unwanted visitors. There are various types of mousetraps available, each one having its own mechanism for drawing in and capturing a mouse or rat (or other small pest). Remember that these small-scale measures are no match for serious rodent problems. Here’s a sampling of some readily available mousetraps. Traps that use an adhesive to snare pests are usually deployed against small mice and other young rodents. The advantages of glue traps include low cost, simplicity of use, and ease of disposal. One drawback is that glue traps lose effectiveness in dusty and dirty areas, and areas that are either very hot or very cold. When dust and dirt cover the trap, pests can easily walk over it, and extremes in temperature can cause the adhesive to lose its stickiness. Also worth noting, a rodent trapped in glue is not necessarily sentenced to death, provided you get to it soon after it’s been trapped. Pouring a little vegetable oil on the trap will release the rodent, and you can send him or her off into the wild. The snap mousetrap is what often comes to mind when you hear the term mousetrap – think of an episode of Tom and Jerry, and you should be able to picture one. These snares are usually wooden, require bait to be placed on them, and use a spring mechanism to snap down onto mice when they come in contact with the bait. Unlike glue traps, mice don’t typically survive snap traps, as a metal bar strikes them swiftly on the neck when they tug on the bait. Yes, even mousetraps have been made into technological devices. 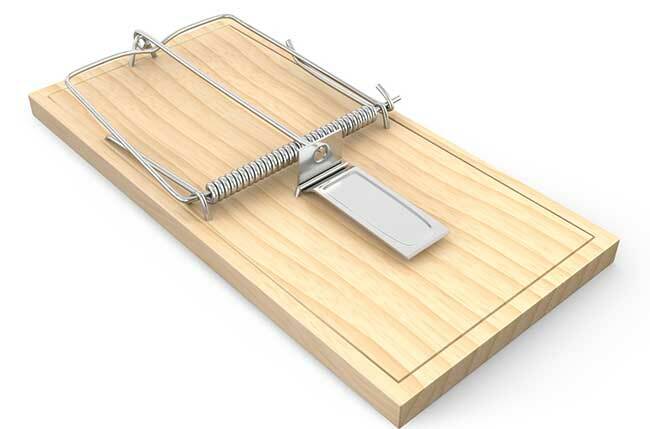 Like snap traps, electronic mousetraps use bait to lure mice and rats into them. But instead of killing the mice with a swift metallic blow, electronic traps send a high-voltage shock into the mice, electrocuting them. Electronic traps typically run on battery power; for some models, four AA batteries will power the trap long enough to kill 150 mice. The traps use circuits to sense when a mouse has entered the trap, and to then deliver the high-voltage shock. The mice can then be emptied from the trap without the need to make contact with them. For homeowners who want to capture and release mice most humanely, there are a number of live traps available. These traps attract mice with some type of food bait, and use a metal door that snaps shut when the bait has been touched. Trapped mice can then be released back into the wilderness. Keep in mind that whatever means you use to trap mice yourself, you may be employing a Band-Aid solution to a larger infestation problem. Mouse populations grow rapidly, and capturing one mouse at a time may not be enough to keep a swarm of them out of your home. AnyPest provides not only trapping services, but also measures to prevent mice and rats from entering your home in the first place, such as caulking exterior cracks, and installing metal screening over holes. This entry was posted in Blog on 2015/03/02 by Any Pest.